Since its inception in 2008 The F.E. McWilliam Gallery has gained an impressive reputation for programming important retrospectives of Irish Modernists and innovative thematic exhibitions. The latest project entitled Home Grown consists of 26 selected artists who have an association to the Banbridge region either through birth or domicile. The curators Dr Riann Coulter and Aoife Ruane, Director of the Highlanes Gallery, Drogheda invited selected artists to "create work in response to the themes of momentum, energy, experience or connection." Within this thematic context the collective works feature a significant contribution from established, internationally known and emerging artists. Paddy Bloomer's sculpture and video installation The Home Grown Rocket (2011) responds to the destructive removal of whin bushes (gorse), which is seen as a weed within the local farming community. The artist presents an ironic, albeit humorous solution to this discarded vegetation by converting it into rocket propellant. The viewer watches captivated as Bloomer demonstrates step by step how to manufacture and build the rocket using the discarded bushes, a gas cylinder and an empty fire extinguisher. Inevitably the rocket explodes mid-air after launching itself into the sky. 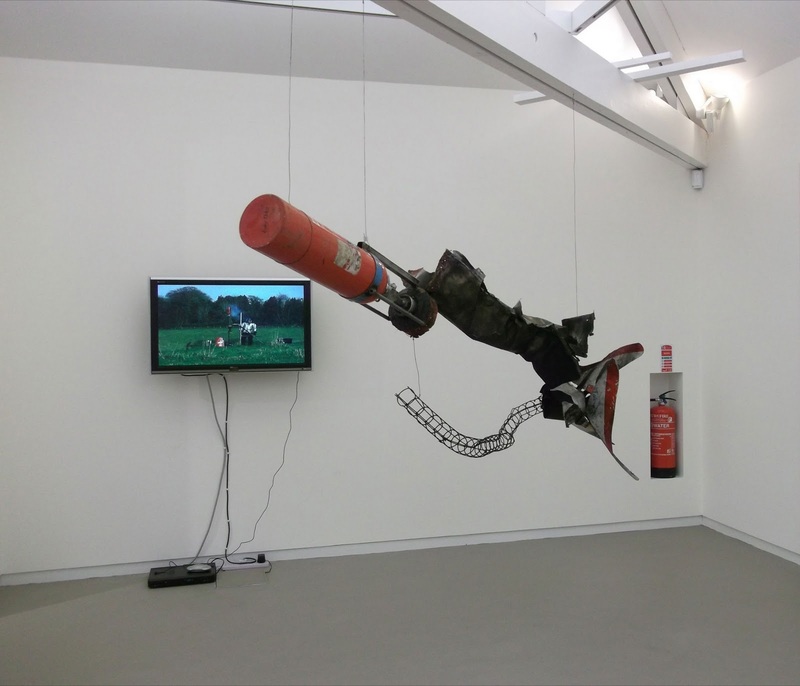 Both the artist and the viewer share a brief moment of jubilation at this successful result but as the remnants of the rocket hang futilely in the gallery space there is an epiphany in relation to the concept of the Home Grown Rocket: in the production of energy through the destruction of natural resources, obliteration is the only conclusion. The relationship of the artist to the town's cartography is a recurring subject explored throughout the exhibition. In Fortress, the artist Robert Peters considers the distorting nature of fear by taking an urban myth from his past in which a concrete block was dropped on someone’s head and merges this with the town's political reputation during the 1970s. Fear dominated the towns’ growth as inhabitants moved there to escape intimidation in neighboring border towns. The artist maps out the borderline of the town with raw materials such as nails and garden string that have then been connected and weighted to a concrete breezeblock. In the work Route to Root by Joanne Proctor, the lines and symbols of the town's map are drawn with ink and intricately embroidered with strands of the artist's own hair. Throughout the duration of the show Proctor methodically sketched the complex microscopic details of a magnified strand of her hair on a large sheet of paper attached to the gallery's wall. The physical interaction of mapping an external space is interwoven with Proctor’s DNA. In A Moment in Time and Route to Root there is a delicate sense of ownership in relation to the environment that the artist inhabits and navigates. The physicality of knowledge can also be seen in the impressive works by Michael Hanna. His graphite wall drawing What a Friend is formed from the International Phonetic Alphabet, which provides symbols representing all the sounds that can be produced by the human vocal tract. The artists tells us that he is "...interested in using the IPA in my work as it is an international 'language' that does not in itself enable international communication, only analysis". Hanna also displays foam sculptures formally presented within a glass cabinet. Each of the objects’ abstract forms references the key physical components involved in speech: pressure, lubrication, volume/space and flesh. In both cases scientific reductionism replaces meaning with isolated mechanics. In stark contrast to Hanna’s work, Patrick Calhoun presents Foundling a sculptural installation comprised of 25 ceramic heads situated on the gallery floor. Each of the heads poignantly represents a symbolic stage in the artist’s life. The works seem to either ascend or descend out of or into the gallery floor on which they have been placed. Calhoun has severed the heads below the nose rendering them mouth less and this deliberate muteness seems to communicate a melancholic state of reflection. Mark Revels effectively portrays a similar sense of claustrophobic despondency in two small alluring bronze hemispheres on which minute houses are repeated in a pattern of circular, never ending grids. The relationship to the Banbridge locale is apparent in the works by Jasper McKinney, Mark McGreevy, Joanne Walker and Martin McParland. In the oil painted triptych entitled Yellow Hill to Mutton Hill I, II, III McKinney’s narrative is one of memory as he marries together symbols that represent an historical self-reflection. In the work by McParland entitled Assembling Line the artist focuses on a distant memory of a shoe factory once located opposite the F.E. McWilliam building and is now the site of redevelopment. Through the application of enamel paint on glass the factory’s exterior has been rendered as a fading silhouette; only the shadow of a memory remains. Artists Dougal McKenzie, Eddie Rafferty, Millie Moore and Lisa Castagner have chosen to exhibit works from their own individual practices. McKenzie’s impressive series of oil on linen paintings reflect upon the political subtext of the Munich Olympics and questions our assumptions within the broader context of the "Games". Eddie Rafferty chooses to document points in a timeline taking his experiences in South Africa as inspiration. An epic moment from the 2010 World Cup, a maidservant in a suburban home and the cliental of a café in Pretoria are all portrayed with accomplished dexterity. 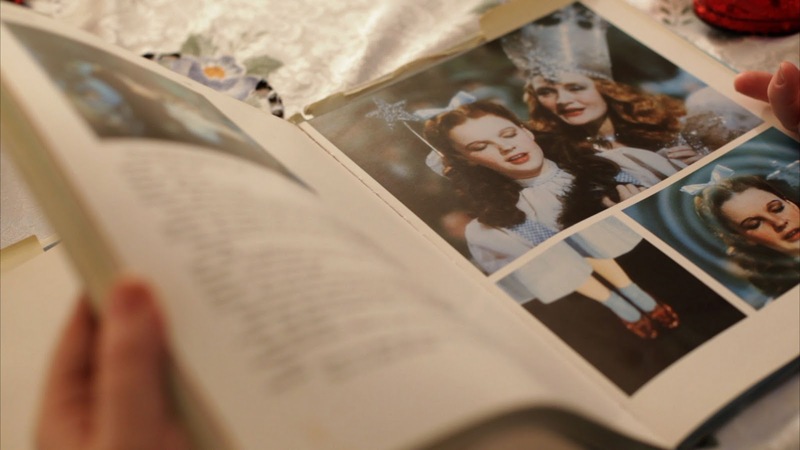 The interviewed subject of Castagner’s video documentary Courage, A Heart and A Brain presents an insight into a man obsessed with icons from fantasy films and television programs. His vast collection of non-Caucasian dolls and related ephemera reveal an attraction and preference for African cultures. His enthusiastic commentary and pride in describing each of his collections provides the viewer with a strong impression of the subject’s personality. With Home Grown, the curators’ courageous decision to seek out artists with association to a specific place has proven to be a valid approach. The quality of the works on display ensures that the exhibition relates to a wide audience beyond the Banbridge location. If you only read Aesthetica online, you're missing out. The December/January issue of Aesthetica offers a diverse range of features from The Way We Live Now, which is on at the Design Museum, London, to Anselm Kiefer opening at Tel Aviv Museum of Art, to a look at Danser Sa Vie at Pompidou Centre, which examines the place dance holds in art history. Plus it comes with its very own DVD of short films from the Aesthetica Short Film Festival. RE: "(...Lisa Castagner....) have chosen to exhibit works from their own individual practices..." - I made this piece purely for the exhibition having never made an art in response to my home country before! I proposed the idea of interviewing a local craftsman and my submission was selected. Just wanted to get that straight.